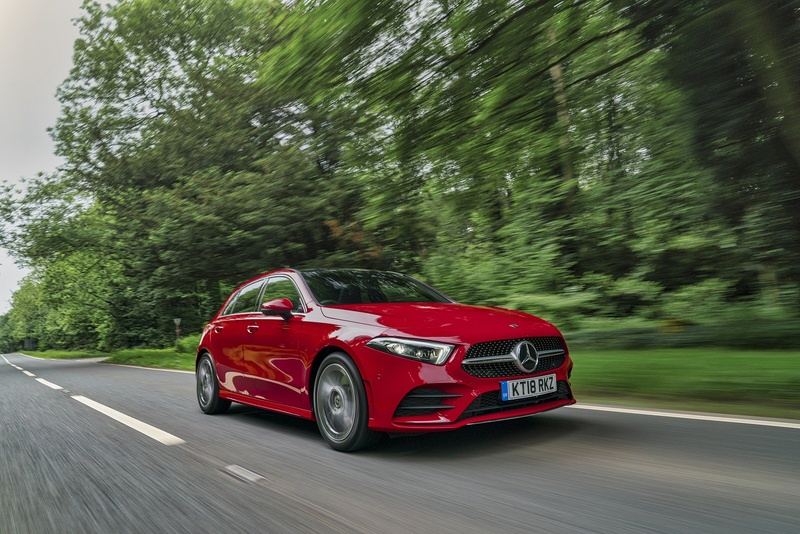 The new Mercedes-Benz A-Class hatchback (launched in 2018) offers all the great Mercedes characteristics — stylishness, practicality, engineering excellence — in a pintsized hatchback body. The new generation, which mixes an aggressive “predator face” with a super minimal body, is probably the best looking hatchback I’ve ever seen in a while. And if you combine that with some smart technology and an engaging driving experience, you’ve got yourself one heck of a car! The fourth generation A-Class comes with a fresh new look. New simplified body panels glide along the side towards a big angry face with a diamond grille, sharp side vents and slick headlights. The side and rear of the car are pretty simple with clean panels, no-fuss taillights and a chunky exhaust. There’s not too many optional cosmetic extras but I’d recommend taking a look at the multi-beam LED headlights, which adapt to oncoming traffic to avoid dazzling other drivers while still providing good visibility for the driver. It’ll also selectively light different parts of the road, depending on whether you’re in the city or the country, which is cool. The A-Class cabin is a lovely place to be with a new slightly industrial feeling cockpit design. The air vents, for example, look like mini turbines with sharp blades fanning out from the central spoke. 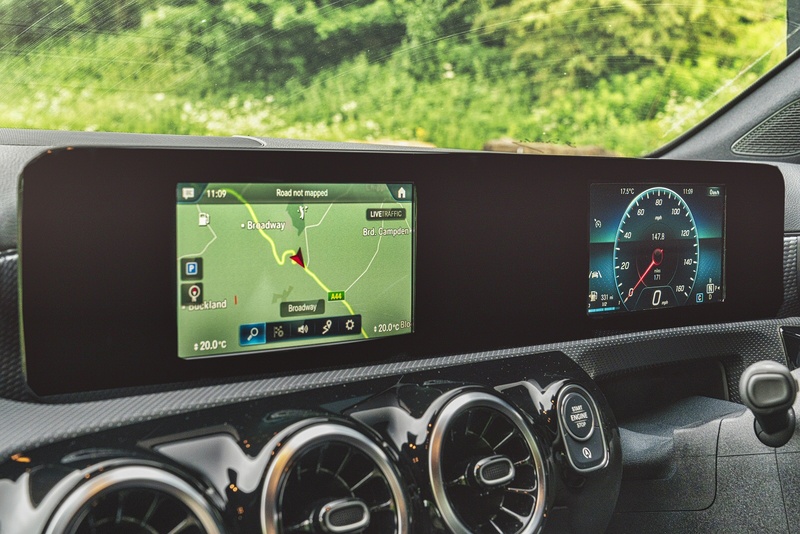 Throughout the cabin, Mercedes' designers have used clever highlights like the man-made leather on the seats, dash and steering wheel to break up what could have been a pretty monotonous design. While most of the interior features are a treat to use, the glossy plastic underneath the front dash and storage door are prone to scratches and the climate control switches feel quite flimsy. But if that’s all you can fault a car on, it’s probably a good sign! The main highlight of the A-Class is the dual seven-inch touch screens that come as standard across the C-Class range. The driver's side display right replaces the traditional instrument cluster and the display on the left operates like a traditional infotainment screen. They both work really well and integrate really nicely into the design of the cabin. If you think the screens are a bit on the small side, you can upgrade to a 10.25-inch version in the centre. I’m not sure it needs it though as the seven-inch panels look brilliant and feel great to use. The C-Class tech isn’t without its drawbacks, though. Unfortunately, the infotainment system doesn’t work with either Apple CarPlay or Android Auto as standard, which, frankly, is really disappointing for a car released this year. 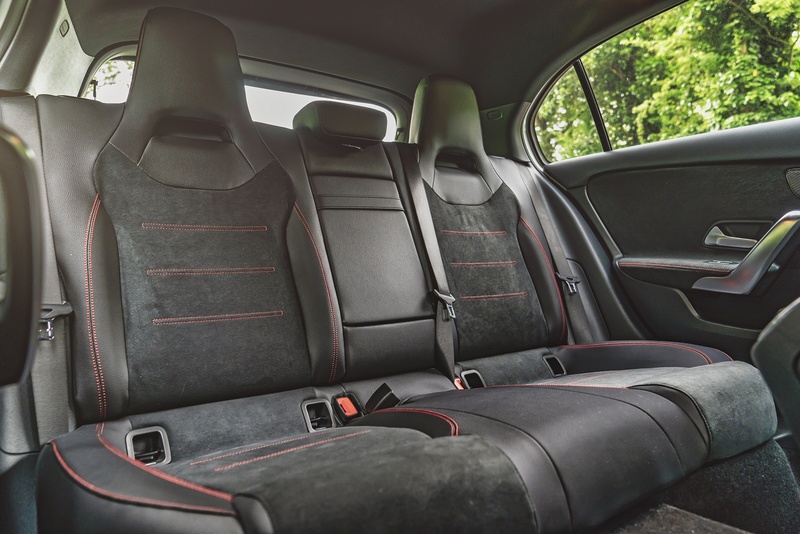 The seats have plenty of adjustment options and offer massage function — yes, really — which mechanically moves certain sections of the seat to improve your blood flow. And then there’s the steering wheel, which is the same one in the vastly more expensive S-Class. It's a really nice feature in what is essentially just a very nice hatchback. In short, Mercedes has stuffed as much as possible into the A-Class interior to raise it to a completely different level. And they've succeeded. 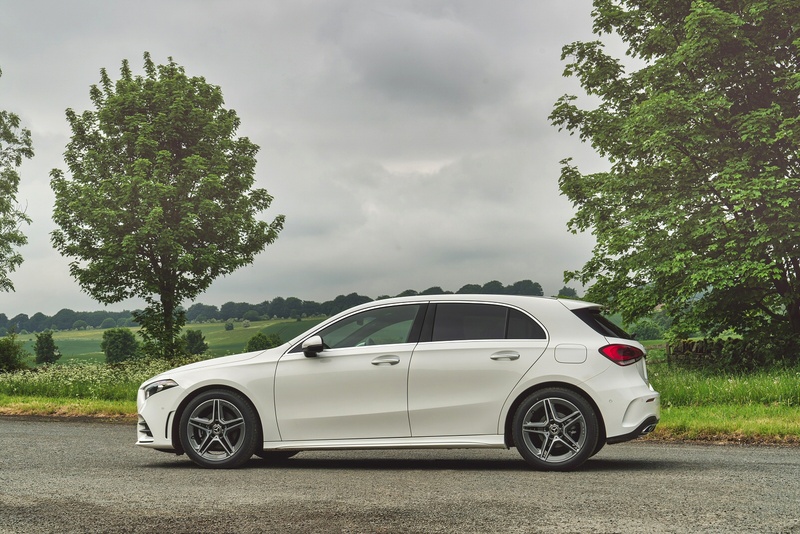 You can lease the A-Class in three different trims — SE, Sport and AMG Line. Think of them as entry-level, fast and track. Under the bonnet, you’ve got three engines — a 114 bhp 1.5-litre diesel, a 160 bhp 1.3-litre petrol and a 220 bhp 2.0-litre petrol. The smaller petrol engine is a willing little workhorse but you need to really work it to get the best out of it. The diesel is economical but won’t set your loins on fire. Finally, the 2.0-litre petrol is the most entertaining of the bunch but it’s relatively thirsty and tends to push the price up a bit. 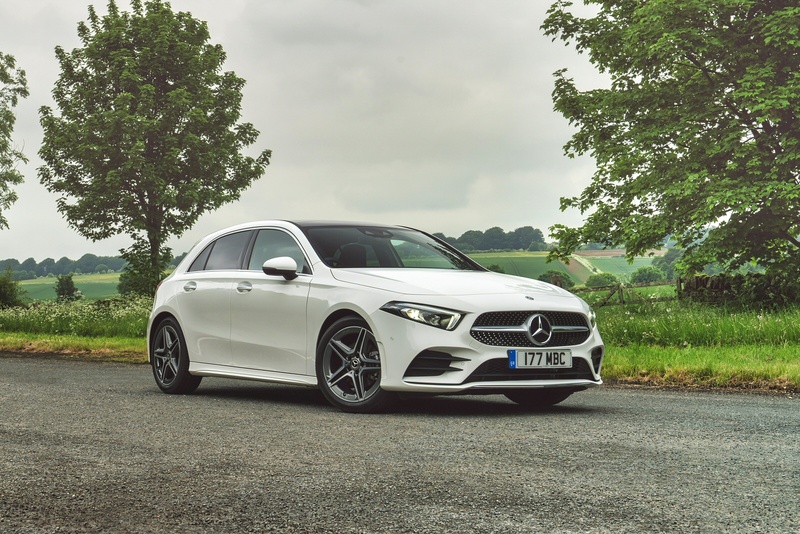 The SE is only available with the diesel, the Sport comes fitted with either the diesel and the smaller petrol and the AMG Line comes with your choice of the three. All models come with seven-speed automatic transmission and all wheel drive is optional. 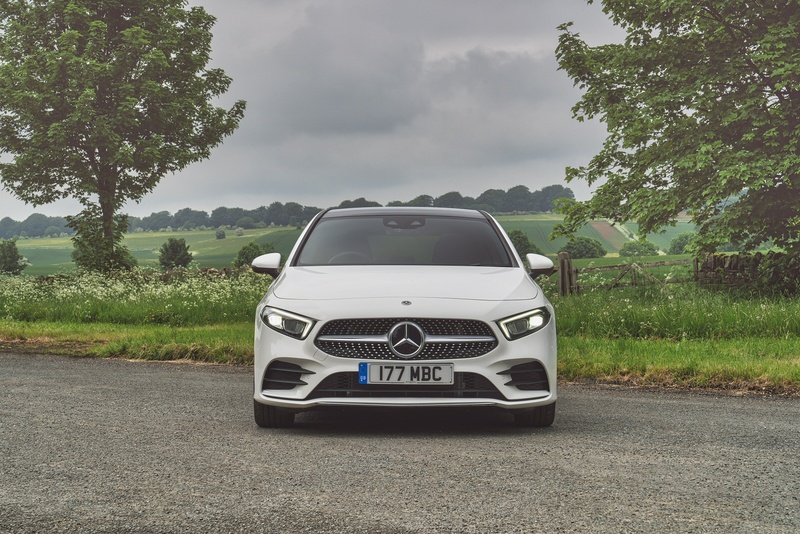 On the road, the new A-Class delivers a much improved driving experience compared to the older model. The suspension does a good job smoothing out the bumps and keeps you fairly planted through the corners. Switch the variable ride selecter to Sport and the ride stiffens up even more and steering gets a bit more lively. 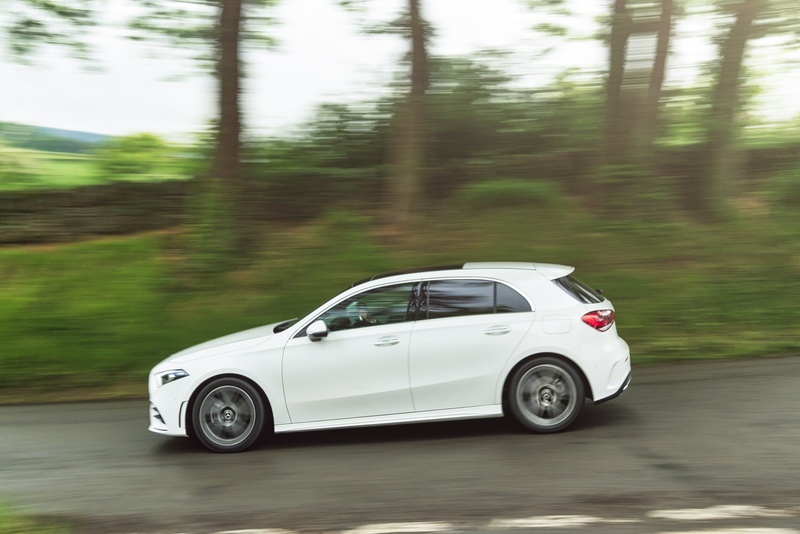 Speaking of steering, the A-Class feels great to drive — accurate, responsive and tactile. While it won’t bother hot hatches like the Golf GTI, it’s a fair bit better than most comparable hatchbacks. The front seats are really impressive. The seats are super comfortable and supportive and come with both manual and electric adjustment options. Space is impressive for a sleek hatchback with enough head and legroom for drivers and passengers over six foot. Front storage is also impressive with a decent sized glove box, deep door bins and cup holders below the centre console and behind the handbrake. Rear space is also good. It’s not nearly as spacious as the front but the roof stays fairly level over the rear seats then rakes down towards the boot. This design gives the rear seats much more head space than other hatchbacks. Boot space is improved compared to older version but is still a tad smaller than competing hatchbacks. There’s also no adjustable boot floor, which is a bit of a pain if you’re loading/unloading larger loads. Sound insulation is also much improved over the third generation. 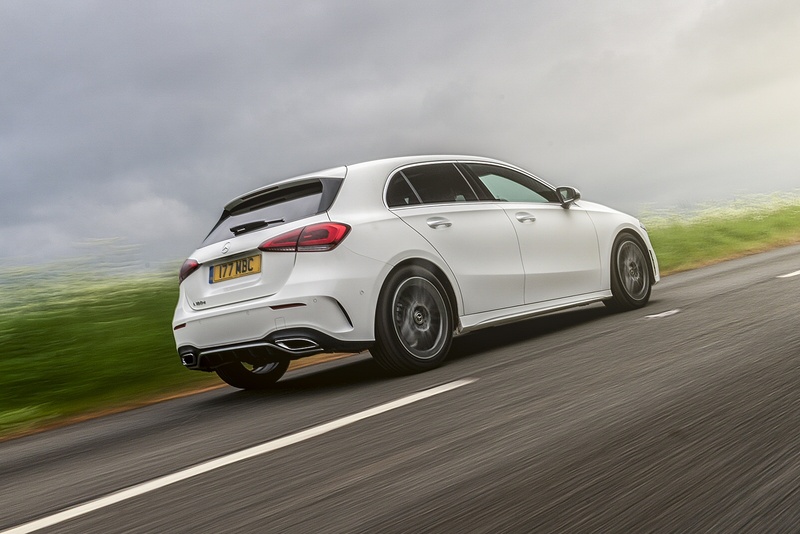 Wind, road and traffic noise is greatly reduced to the point where you can have a normal conversation at motorway speeds..
As I mentioned above, the A-Class is offered in three model trims — the SE, Sport and AMG Line. There’s a bunch of great basic equipment like the dual infotainment screens, active lane keeping, attention assist and so on. If you jump up to the Sport trim, you get 17-inch alloys, dual climate control and heated seats. 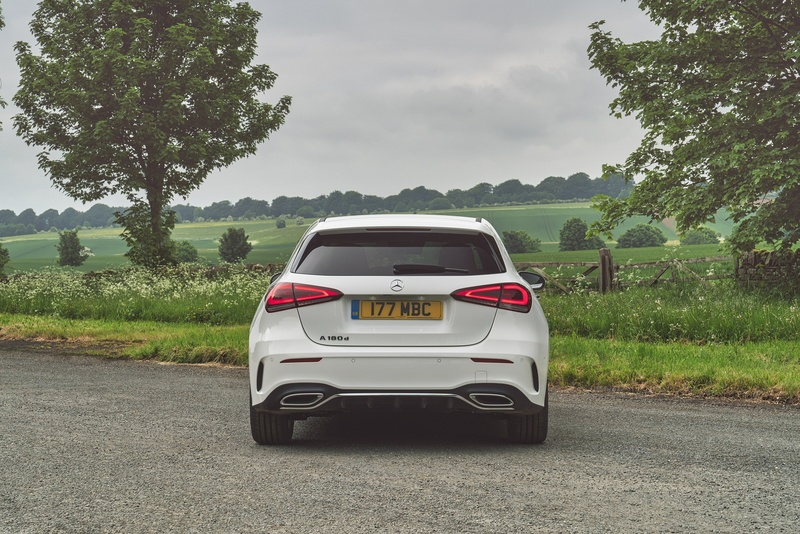 Bump up another level to the AMG Line and you get some additions to the bodywork — the AMG front and rear aprons and chrome exhaust detailing are probably the most obvious addtitions. 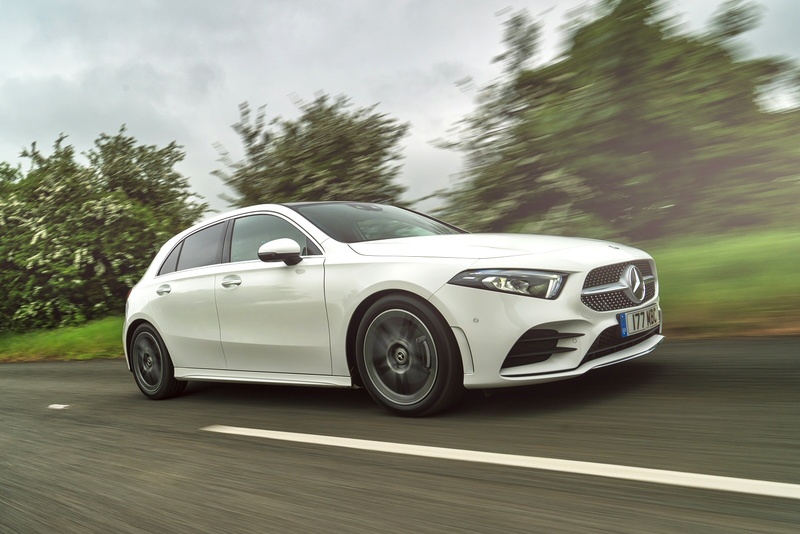 Then you’ve got the 18-inch alloys and three-spoke, Nappa leather steering wheel, which really make the AMG Line feel like a completely different car. 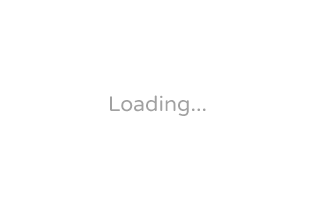 On top of the basic trims, you’ve got a bunch of optional packages that bundle together optional extras. The Executive Equipment package, for example, adds in a load of new mirror detailing, a bigger 10.25-inch central display, active parking assist, heated front seats and a rear armrest. Then you’ve got the Premium package that adds everything in the Executive Equipment package and a second larger panel for your instruments, a 64-colour lighting system, illuminated door sills, keyless entry and a mid range sound system. As I mentioned, the standard infotainment system doesn’t support smartphone mirroring, which, I agree, is ridiculous for a car launched in 2018. However, you can pick up enhanced connectivity along with wireless charging in an optional smartphone pack. There’s a load more optional extra packages but it’s way too much to cover in one review. If you’re interested, check out Mercedes’ website for full details. 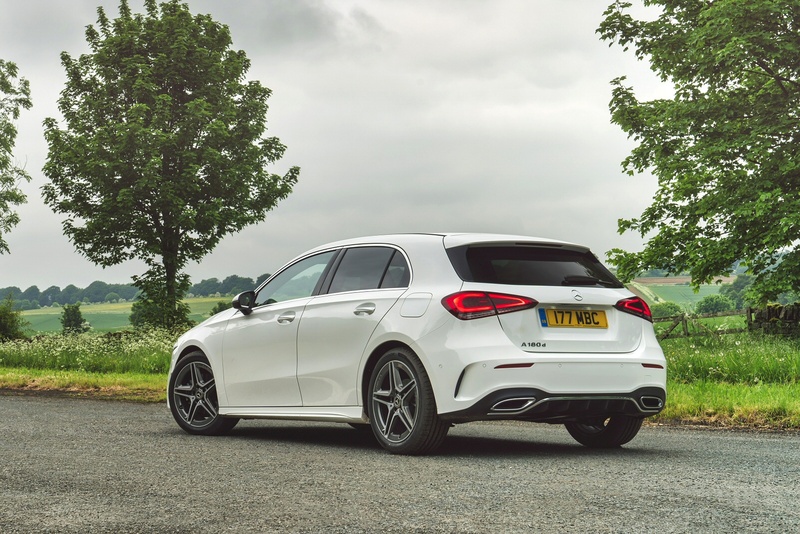 Oh, and if all of the above technology was not enough, the Mercedes A-Class comes with Mercedes Me smartphone app that allows you to lock the vehicle, check your fuel and other services right from your phone!